Our morning visit to the Terracotta Museum was a rather wet experience, so a pleasant surprise at lunchtime is a sandwich lunch at the Tian Lai Teahouse. The prospect of a sandwich lunch is a very exciting one for some of my fellow travellers. 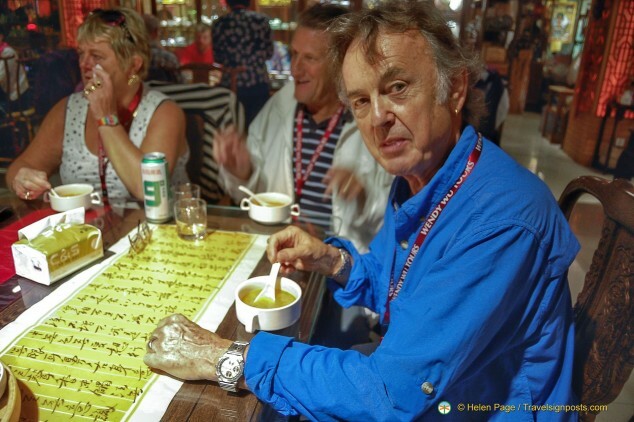 But, more than just a sandwich in a tea house, we are treated to an entertaining and informative demonstration of the Chinese Art of Tea. 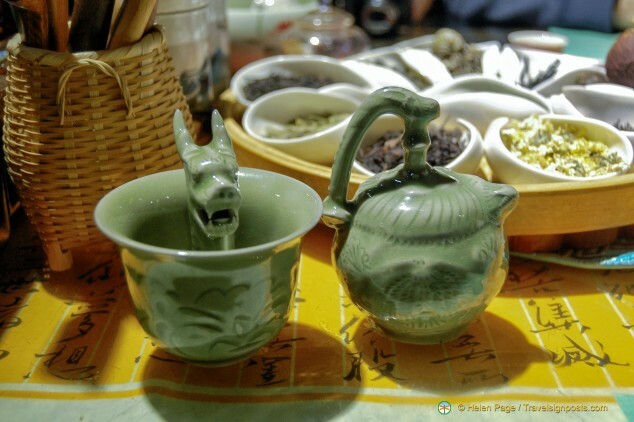 The drinking of tea has been an integral part of Chinese culture since the early dynasties, and was especially popular during the Tang dynasty. Tea was considered a beverage that provided pleasurable taste and tea drinking became synonymous with sophistication. Chang’an (modern day Xi’an) was the capital of the Tang Dynasty and this was a period of progress and stability. There were many inventions during the Tang dynasty and the tea houses were a place where Chinese scholars used to meet to share ideas. Tea houses flourished during the Tang Dynasty and even in Xi’an today, there are many tea houses. 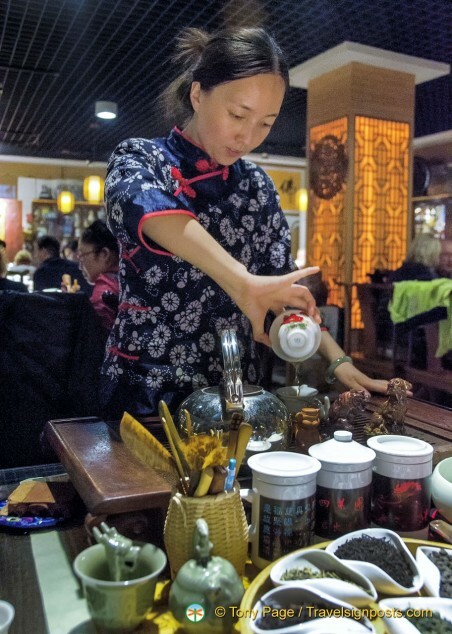 There appears to be a revival of the tea house culture in Xi’an today as people, faced with the fast pace of life, are looking for ways to relax. 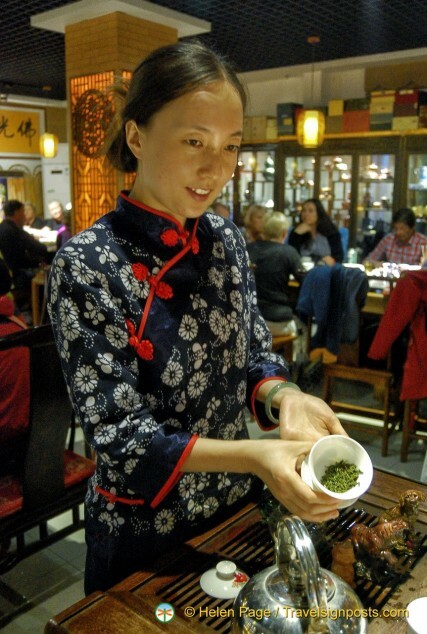 In the Chinese culture, tea is more than a drink. There are tea drinking customs in relation to Chinese marriage ceremonies where the bride and groom kneel in front of their parents and serve them tea, to express thanks to their parents. At family gatherings, the offering of a cup of tea by the younger generation to their elders is a sign of respect. The Tian Lai Teahouse is a cozy place and we are grateful to be in here and out of the rain. 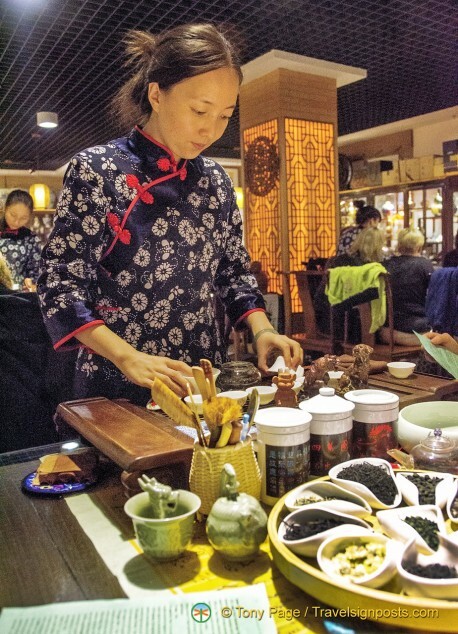 We’re only into the eighth day of our Wendy Wu Grand Tour of China trip and already many in our group are showing signs of “Chinese food fatigue”. They would be happy for a humble sandwich or any kind of western meal. When we are all seated at our table, hot corn soup arrives. Even for those not fond of corn soup (see Tony’s expression), it at least brings a warm feeling to our stomach. 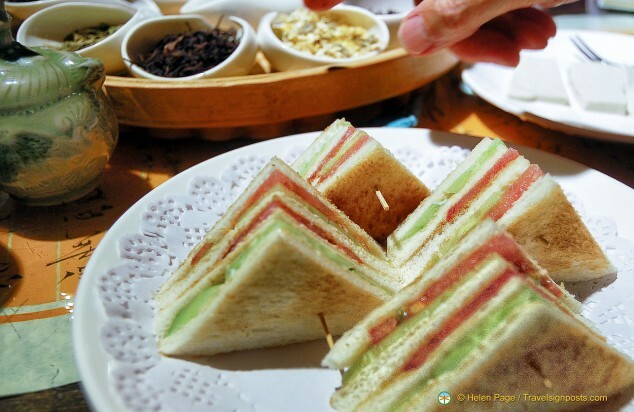 After the soup, our plates of very neatly cut sandwiches arrive. As soon as lunch is over, a dainty young lady presents herself at our table. She is our hostess for the tea making demonstration. 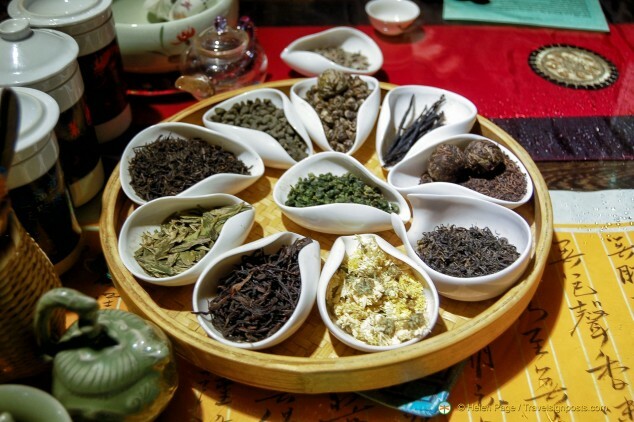 On the table stands a large tray with ten different Chinese teas. 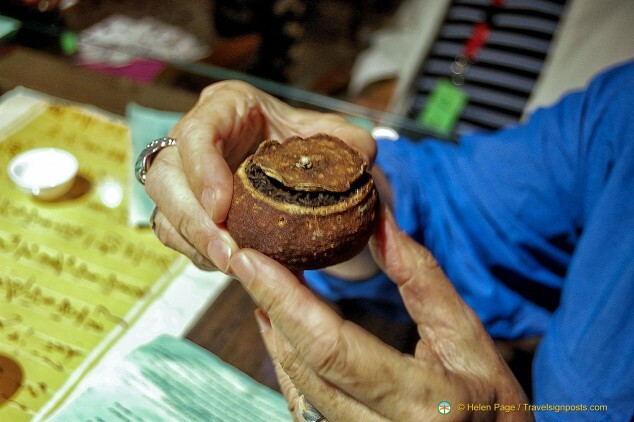 As she explains the different types of teas, she passes around a few samples for us to smell. The orange scented tea smells really good. 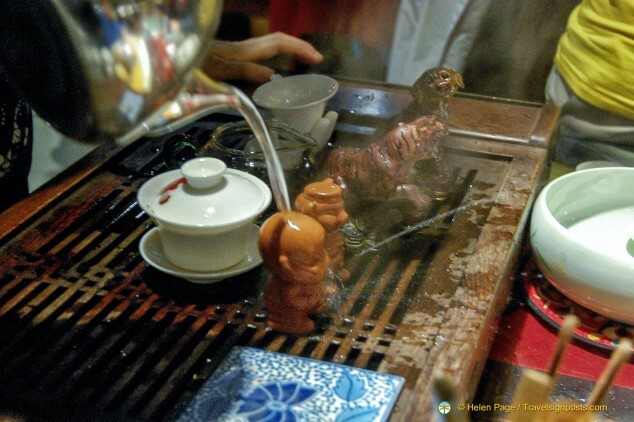 In the Chinese art of tea making, the temperature of the water is all important. Different teas require different water temperatures to bring out the best flavour of the tea. Green teas for instance are more delicate and require a lower water temperature than the black teas. Another important requirement is making sure that the cups are not cold and so our hostess pre-heats her tea cups. She makes use of the discarded hot water to show us a few gimmicky products that they have in the shop – a tea mug which changes its pattern when hot water is added, hilarious little pottery figurines which pee when hot water is poured over the head, and a couple of other tea wares that make entertaining souvenirs. Our hostess is a picture of gracefulness as she makes up three different types of tea for us to smell and taste. There’s no teapot involved and she deftly makes the tea in little porcelain teacups, pouring hot water back and forth, without scalding her fingers. Although the sandwich lunch is a treat for some, I rather enjoyed the tea making ceremony more. After the demonstration we have time to look around the shop. All types of tea and tea sets are on sale here. Some of us couldn’t resist the gimmicky tea cups. 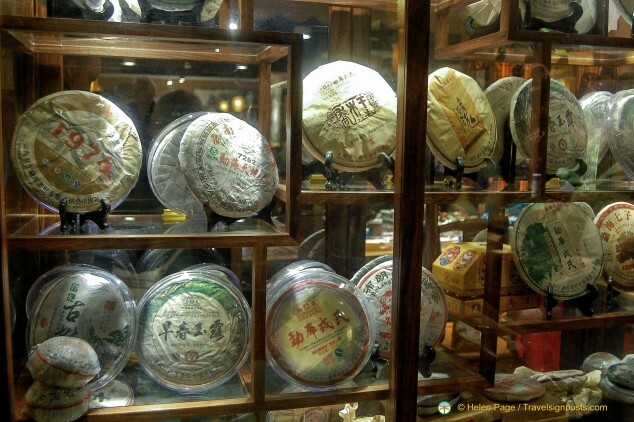 You can see more photos of the Chinese Art of Tea Here. Hi Helen! I am so excited to have found your photos and travelogue on the tea house near the Terra-cotta warriors in Xi’an, China! My husband went there a few years ago with his graduate school class and bought a couple of the “gimmicky” ornaments that change color when hot water is poured over them. He brought home our two Chinese zodiac animals (pig and snake). Recently my one year old and I broke the snake which we’ve always had sitting in our kitchen. Any chance you have an upcoming trip back there or know anyone who might be going and can ship me a replacement as a surprise to him? I would be forever grateful and of course pay for the product, shipping and inconvenience. Please email and let me know. Thank you! I’m sorry to hear that you’ve lost one of your Chinese magic mugs. Unfortunately, we’re not planning any trip to Xi’an in the near future and so last night I did a search online for you. All I managed to find was Chinese manufacturers wanting to sell them in minimum batches of 1,000. This morning I tried again and found a U.S. based online shop that has them. Although, they’re not quite the Chinese one you’re looking for, it may be a compromise if you’re desperate. I am going to Tian Lai tomorrow! 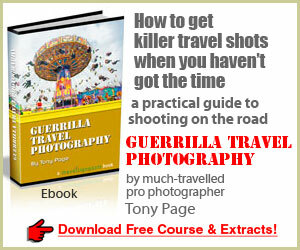 If you read this in time and still want to have it, I can buy it for you and send it to you!